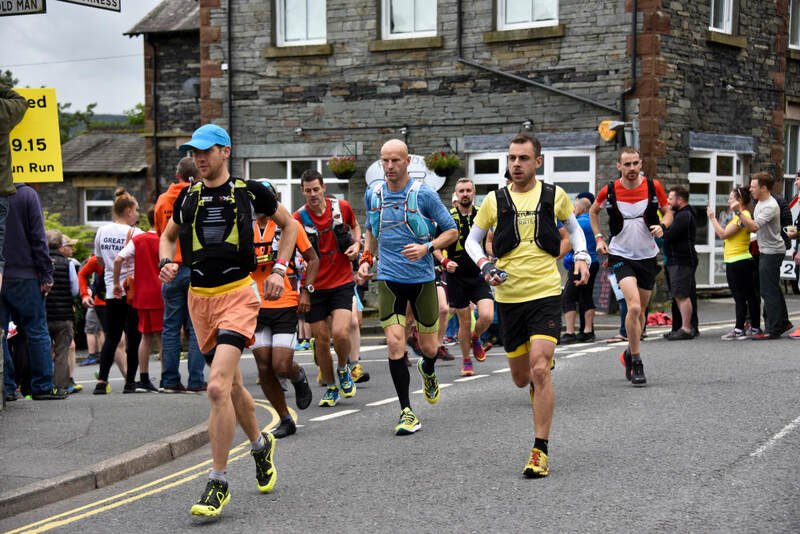 Lakeland 50/100 weekend is a special one in the UK ultrarunning calendar. The races embody all the best bits of UK Ultrarunning. A superb course, fantastic volunteers and a community inspired race environment. This was the 10th anniversary. The organisers really care and as always, that is the most important ingredient in making a race a great one. Back in 2014 I'd decided that I wanted to have a go at three Lake District 'projects'. 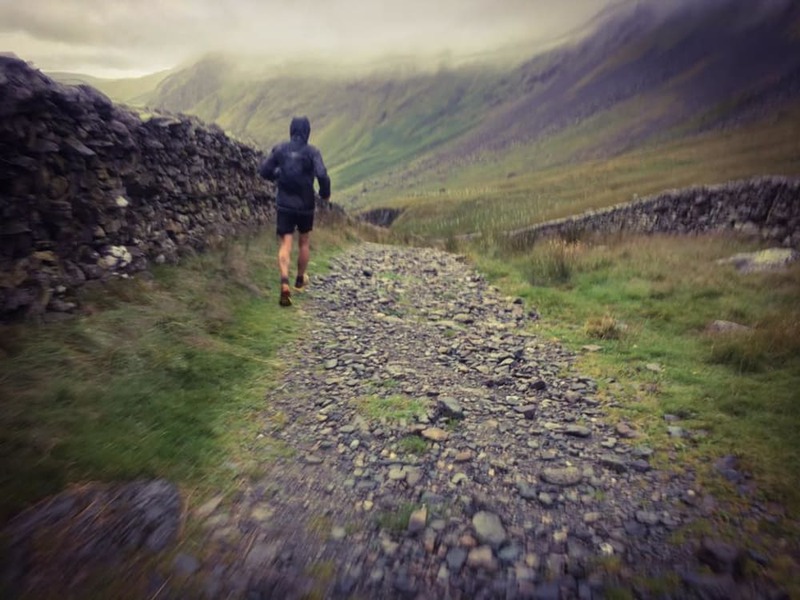 The Bob Graham Round, the Lakeland 100 and summiting all of the 214 Wainwright tops. A bit numbers focused sure, but there you go. I thought it would take two years but it actually ended up taking nearly four. In September 2014 I made it around the BG. I completed the Wainwrights in March. With regards to the LL100, i'd had a couple of goes and neither had worked out. In 2015, I fell at around mile 55 and cracked my hip. In 2016 I stopped after just a few hours. This time I felt really good coming in to it in spite of being drastically down on training. In 2015 I came in off almost weekly trips to the Lakes. The reality of life now is that those trips are just not so forthcoming. I made do with what I could. For perspective I was down from 90 miles and 15000ft per week in 2015, to 57 miles with 11000ft per week in the core 8 week block. But for lack of mileage, I was otherwise up for it. Course knowledge is really helpful here. Firstly because a lot of it is done in the dark, secondly because it's not marked. I do know the course back to front and my kit, footwear and nutrition are down to a fine art (see bottom of this post for the full list). On balance this is a hard race. 105 miles/ 21000ft of climb. A 40 hour cut off with a finish rate of 62%. But that still translates as there being a lot of good running. This is definitely a runners course. Whilst there is plenty of rough ground and some honest climbs and descents, no climb that lasts longer than a couple of miles. When one compares that with an Alpine climb which can easily go on for 2-3 hours, this is a very different level. In 2015 I was guilty of chasing 'Terry's ghost'. I think his course record has lured many very good runners in to starting too hard at this event in recent years. The fact that 10 years of this race without anyone coming within 30 minutes of Terrys time says a lot. This time would be different. I'd run my own race and see how I came out. 1800 start and out of town over to Seathwaite a group of 6 or 7 of us fell in together and that included all of the people I expected to be there. Mike Jones last years champion. Jayson Cavill the LL50 record holder. Chris Brookman third last year. Out in front were Bryn Jones and Lawrence Eccles. With respect to those guys they have a few years in a row now absolutely hammered it up the Walna Scar Road at an unsustainable pace for anybody and I figured we would probably see them again before long. We got blown about with a side wind and some rain about a mile in. I would hazard that it ended up raining around 25 times on and off during the race. Seathwaite in 63 mins in 2015 was insane. 69 mins this year felt great. Over to Boot Mile 14 the ground was pretty choppy, a lot of mud and a decent fall. We all left there together but Mike put the hammer down and put a couple of minutes in to our group very quickly. Just before Wasdale Head mile 19 I literally left one of my La Sportiva Helios SR's in a bog on a descent and had to back track. But with the exception of Mike, we all entered the check point together and by now had passed the early leaders. Over Black Sail pass Jayson and I took things really steady. Headtorches on over the other side, up and over Scarth Gap and to Buttermere in 4:55. Record pace 4:44. Mike ahead, but that was all. Jayson and I figured Mike was going all out for the record and with the ground a little bit slower than normal that seemed a big ask. After a pit stop at Buttermere I ran my favourite section over Sail Pass to Braithwaite well. And coming out of the other side I caught up to Jayson on the sweet stretch of tarmac alongside the A66. He was a bit down in the dumps and I think it greatly helped to fall in together. Sharing the trail on and off with Jayson for 40 miles was one of the biggest highlights of the race for sure. We were promptly dropped however, by Marcis Gubats who seemed quite intent on forcing a race, something I wasn't up for with 70 miles to go. We let him disappear on the out and back up GlendeTERROR. Just before Blencathra mile 41, Jayson seemed to fade a little and I decided to push on. Marcis was a couple of hundred metres ahead and Mike was about 20 minutes ahead. A long section now over to Dalemain of 3 hours or so, past the place where I fell in 2015 and turned the headtorch off a mile or so before Dalemain check point at mile 59. I arrived there with Marcis still inside. Mike left 14 mins earlier. Everything was going to plan. Dalemain is the only place you can pick up supplies/ access a drop bag from the start. I'd barrelled through 20 of my 21 Salted Caramel Gu Gels by this point, but everything else felt good. So i just picked up a handful of gels. My aid time there was about 90 seconds. Pretty good. Over to Howtown, 59 - 66, I felt dreadful. This point in the race, 0500-0600 is the coldest part of the day and therefore my least favourite. It's such a runnable section too but I just couldn't get moving efficiently. As I dropped in to Howtown, Marcis hammered it out up the short road climb to Fusedale and that was not a sight that offered any kind of boost. Three chia charge bars in the check point were however pretty lovely and that really helped. Up Fusedale I really took my time. Then I had a bit of a flyer over High Kop/ Low Kop and around Haweswater. It's a great section of single track and I went well around there. At Mardale Head, 30 to go. Ham sandwich in a cup of soup. Smashing. Up Gatesgarth nice and steady. Wet and very windy on that climb but still moving well. Down the other side I ran the descent all the way to Sadgill pretty well, with a big boost from cheer-squad captain Debs Martin-Consani who snapped this shot as I pushed on to Kentmere. Just before that check point it was nice to be greeted by Rupert Bonington or Mountain Fuel fame, Kirk Hardwick and then Cat Simpson - all dressed as sheep. I had a little pasta there and another loo break but I ran in and out of there strong. Whilst I knew I wasn't anywhere close to Mike or Marcis I also felt I was doing easily enough to hold on to third. 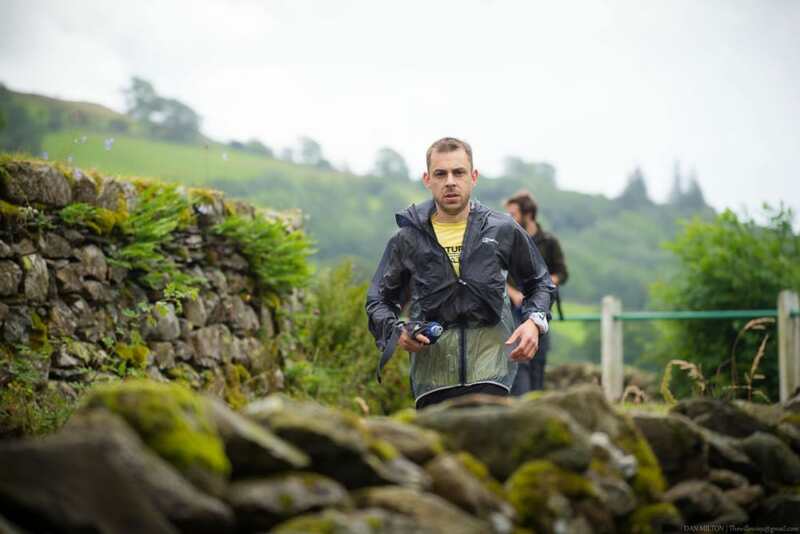 From Kentmere in, there's no significant challenges, other than you haven't any excuse not to run. But my Ambleside split was well down on what I wanted and it was on the short road climb up to Loughrigg at mile 90 that I felt I was in a hole I probably couldn't get back out of. My stomach was doing loop the loop and finally seemed to pack in which is rare nowadays. I shuffled around Elterwater. By now any thoughts of an improvement on third had completely disappeared. I ran, but it was a massive slog. As I crept towards Chapel Stile mile 95, I could feel for the first time I was probably haemoraging time to the competition behind. And sure enough, around a half a mile from the aid station I could hear the clapping behind for the next runner entering that 95 mile check point. I figured it was Jayson, back from the dead. At the end of Blea Tarn, just around 99 miles it was actually Tony Maxwell who came past. Such a nice guy. He just shook my hand, asked me if he'd maybe seen me before - on a DVD or something? Sort of. Anyway, he ran away from me as if I were standing still and it was now about forcing as much as I could not to hand any more places back. In the end my final split from Tilberthwaite in was under an hour, considering how I felt that wasn't too bad. I had an enormous chunder on top of the last descent which actually helped a good deal. And I was able to jog the road back to the school and crossed the line for a time of 22:09. Fourth Place. Mike had a superb race, with Marcis picking up second. Those guys thoroughly deserved the positions they got from their hard work. They were far stronger than me on the day. Full results are here. I think on balance we can call that a good performance. 85ish very good miles. 20 very hard ones. Third would have been great. Not to be this time. This race is very significantly harder than anything we organise. It's got a big starting field without being OTT. Good level competition, though of course the navigation element is a factor so to race your best you simply have to know the route. A great journey run around the whole of the Lake District. Here's a bit of advice for anyone interested in taking it on. Footwear: Don't over think this part. The advice I see pre and post race on foot care these days seems to be getting more and more obscure. Keep it simple. Don't try two pairs of socks, three different types of lube and shoes the wrong size. Pick a pair of socks that fit, and a pair of shoes that fit. There are almost no grassy descents on this course. So something to handle rock is better. I wore a La Sportiva Helios SR but I would say that is fairly minimal for this course and the loose rock. The Bushido or the Akasha would be perfect. Socks wise I wore simple Drymax Trail Socks. Cheap, effective. Sorry to those who really suffered with their feet but I had no blisters, no hot spots. Didn't take my shoes or socks off until after. Nutrition: With one drop bag at mile 59, you are going to end up carrying a lot of weight to begin with if you're not careful. Check point food consists of biscuits, jelly babies, coke - everywhere. Then you can get tea, coffee, soup, sandwiches at most places. If we say that gold standard nutrition is 300 calories per hour, my advice is to carry 150-200kcals per hour on your person and then top up with something at every other CP. I had 20 gels on me to Dalemain. 15 from there in. A few babybels and a few chia charge bars/ snack mars on me at all times. Late in the race I had some sandwiches, pasta, soup BUT in, down it, out. Don't sit down, get on with it. Hydration: Don't start with a massive bladder or litres of water in bottles. There is fresh flowing water on almost every section. Take one of these with an in built filter and top up from the frequent streams. I ran with a 500ml handheld and didn't run dry once because I topped up on the move. Something I also saw Jayson Cavill doing to great effect. Don't add to the already substantial weight of your pack by taking loads of water with you from the start. Take a reserve flask if you are in doubt. Kit: Here's my kit list. This fills the mandatory requirement and more. People seem to think that you need a 15 or 20 litre pack to get this stuff inside. You can get two complete sets of mandatory equipment in an 8 litre S-Lab vest. Two complete sets plus 20 gels and a bunch of cheese. You can say, oh well he isn't carrying water. That's TWO sets, so take one set out and replace it with water if you want. You'll excuse me of course if we link to our own great store where we stock this stuff anyway because we believe it to be the best of the best. I am sponsored by some of the below parties. However, if that piece of kit were not right for this event I would absolutely not be recommending it. - Headtorch: Petzl Nao+. Don't scrimp on this. Running well in the dark requires good light. This is the best. - Waterproof Jacket: La Sportiva Hail (20000mm). I also had a second waterproof, a Berghaus Vaporlight rather than carrying Goretex. It's cheaper to buy two lightweight waterproofs than one Gore Tex, before you worry about the cost of that. If the temperature was due to be 5 degrees colder or more I would have swapped to my Montane Spine Jacket. For the ongoing support, a massive thank you to La Sportiva, Petzl, Hydrapak and Lyon Equipment. 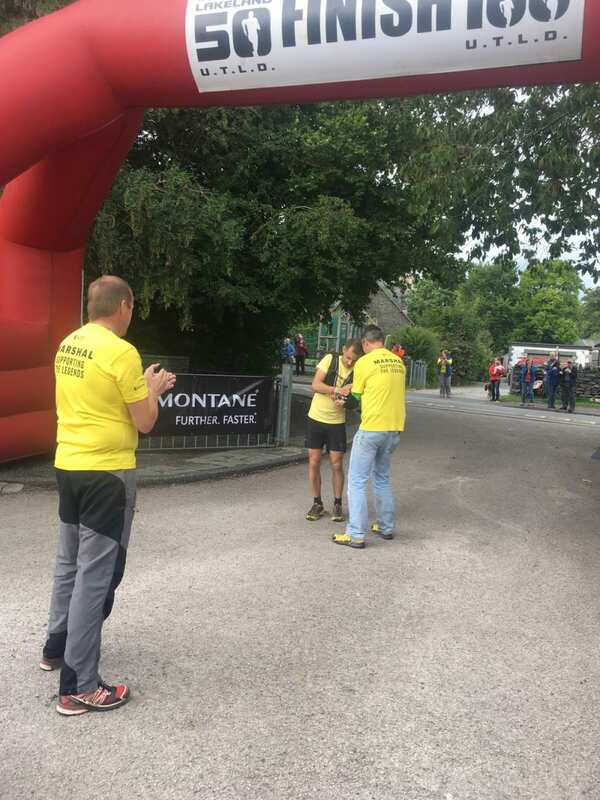 To Terry, Marc and the team at the Lakeland 50/100 for making this a truly special occassion each year. Biggest thanks to the Marshal's and Volunteers who as always are the most important people of all in these things. All Done now. Photo c/o Drew Sheffield.